HomeJuly 2013How do we pass on our faith to young people? How do we pass on our faith to young people? How can we pass on our Catholic spiritual heritage to young people and nurture their faith and spiritual life, asks Virginia Ryan. How can we pass on our Catholic spiritual heritage to young people in our midst and nurture their faith and spiritual life? Maybe we are looking at the situation the wrong way around? Perhaps it is not so much about how we can pass on the faith to our children, but rather, how can I develop and enrich my own Catholic spiritual heritage so that I have a precious treasure, a treasure worth inheriting? I started to think about things in a different way. It is my children who have led me to a deeper and deeper relationship with God and with the Church. In truth, my children have been the primary spiritual teachers of my life – more than any bible, Church sacrament, minister or theologian. My children have taught me everything I know about the spiritual life: prayer, God, Jesus and the Church. The birth of my first child utterly changed me. There was no preparation or warning or knowledge that equipped me for the event. I was taken into the wilderness where I was totally transformed. In the wilderness I began to understand who God is, who I truly am, and what really counts in my life. So, what is it that my children have taught me? 1. I can’t give what I don’t have. I was aware that I needed to put the focus on myself and start investing in my own faith life and my own spiritual journey. My children were watching and listening and learning about how I saw the world and how I responded to love and suffering. What was I doing? They could see right through me: my faltering faith, my critical faith and my fabulous faith. We are the children of God, we are the Body of Christ, and we are the Church. It is not out there; it is in here. 2. In the demands and messiness of family life my children taught me to ask the really big questions. What is my purpose in life? Who would I die for? How do I want to live my life? What do I want them to inherit from me? 3. Love is more powerful than any other power in the universe. My children have led me into an experiential love which stretches me beyond anything I could have possibly imagined. In fact, this love changed me from the inside out. It decided everything. It is the only question and the only answer. Slowly and quietly and constantly I began to think about God’s love for me. The imagery from the Christian scriptures began to be coloured more vividly: “I have called you by your name, you are mine… because you are precious in my eyes, because you are honoured and I love you”. Slowly and quietly and constantly, I heard afresh the words of the Gospel and began to appreciate the humanity and divinity of Jesus Christ. His love drew me in because he loves with his whole heart, his whole soul, his whole mind, and his whole strength. 4. My children taught me about suffering. Suffering is an inevitable part of loving. As American writer, Elizabeth Stone said, “Making the decision to have a child is momentous. It is to decide forever to have your heart walking around outside your body”. Suffering is the main portal through which your heart and soul are opened up to the fragility and vulnerability of yourself. It is suffering uninvited, unexpected and unwelcome which makes you cry out again and again: God help me, God hold me, God be with me! My children taught me that I cannot get lost in suffering because there is resurrection. 5. The newborn baby taught me very early on that I am powerless over people, places and things and not in control of the universe, the world, my Church or my community. In fact, it is difficult for me to manage or even know myself. Through this insight I allowed God in, and from time to time, I even allow him to take the steering wheel. 6. The adolescent child taught me the hard way how to pray. It is my antidote to worry. I pray all day and in all ways for my children. I send them text messages telling them I’m praying for them. I send them individual and group emails about how I’m praying for them or going to Mass for their intentions. I never miss an opportunity to say that I am praying for their happiness, their exams, their decisions, their uni presentations and their boyfriends or girlfriends. Sometimes I embarrass them by praying before every evening meal; whoever is at the table. 7. My adult children show me mystery. There is a vast galaxy of mystery at the heart of life; give into it. My children are not me – they are discovering the world, what works and what they believe for themselves. The whole community and the whole world will etch its reality in their soul. Different people, ones I have never met or know, will come in and remake my children. I will sit by and watch and wait and give advice when asked because I trust that God in his infinite wisdom will be their guide. It is their spiritual journey. It’s my experience that our faith is taught and caught. I have had to ask myself: what are my children likely to catch? The best way I’ve discovered to nurture faith and a spiritual life in young people is to keep the focus on me and spend time, love and energy developing my own relationship with God and the Church. Virginia Ryan has been an eductor for over 30 years. 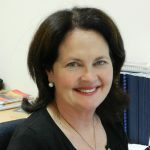 She is an education officer within the Broken Bay Diocese Catholic School Office Mission Team where she designs and delivers faith formation programs for school leadershp teams, school staff and parents. She is a Member of Good Samaritan Education and a founding member of the Broken Bay Institute.